Travis Cole Snellgrove was born to Wendi and Travis on April 12th, 2004. He was born with no problems and was home the next day. He was a very good baby and we had no problems with him for the first month, then he started having trouble breathing and I took him to the doctor. We were told he was fine and were sent home. This went on for a few months with him not breathing well and every time I took him to the doctor they said he was fine and that I was just worrying too much. My mom kept telling me that there was something wrong with Cole and that I needed to find out what but I told her the doctor said he is fine and for her to leave me alone about it, but as Cole got older I knew in my heart that there was something wrong with him. He got to where he could no longer hold his head up or hold his bottle any more. I worked with him for so long trying to get him to sit, and no matter what he just could not do it. We went back to the doctor and told them that I wanted something done that there was something wrong with him and I wanted to know what it was, so they put him in therapy and told me I would be on a waiting list for at least a year to see a brain doctor and that was all they could do. Well that was not good enough for me so I found a new doctor and as soon as she saw Cole she said you are so right, something is wrong but I don't know what and she said that she was going to put Cole in the hospital and have a lot of doctors look at him, and she would get to the bottom of it. She said I did not have to wait a year, that if he was in the hospital they would have to see him so that is what we did. We went into the hospital and a lot of doctors came in and looked at Cole and did many tests. His new doctor came back a few days later and said that the MRI showed that whatever was wrong with Cole was something that would not get better and could get worse and I just fell apart. She said that they did not know what it was so they had an eye doctor come in the next day. He told us that Cole had cherry red spots in the back of his eyes and I asked what this meant and he said it is not a good thing. They sent us home and told us that they would call us in when they got all the blood work back. Once the results were in, we met with the doctors. 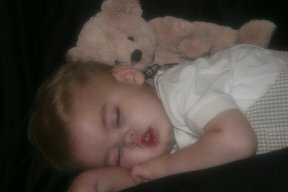 When we got there they said that Cole had Tay-Sachs disease and that he would die by age 4. All I could do was cry and think of my sweet little baby boy and then I looked at the doctor and said where do we go from here? He said all you can do is take him home and love him and take care of him. He said that he would do any thing to help Cole be as comfortable as possible. I brought Cole home and all I did was learn as much as I could about Tay-Sachs disease and I just loved him as I would even if he was not sick. It was not long after that Cole got to where he could not eat or even drink out of a bottle, so he had to get a feeding tube. Everything went down hill from there. All of our days were up and down but Cole was an amazing little boy who would fight so hard just to breathe. He would just spike a fever out of no where and his heart rate would go up and down so we had to put Cole on hospice where we had a nurse that would come in once a week and check on him and she became not just our nurse but a really good friend. 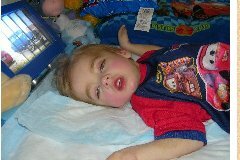 By the time Cole was 2 he was on oxygen 24-7 and on so much pain meds. His seizures would just not stop. He would have a few good days but most of them were spent with just me holding and loving my sweet little angel most of the day. When Cole was 2 years and 10 months old, God called him home. I was sitting in the chair holding him and he took his last breath. I miss my son so bad and I hate for any child to have to live life with Tay-Sachs disease. Now my mission is to help find a cure and put a stop to Tay-Sachs and all the other dieases. I'd like to thank you for reading Cole's story and if any one would like to talk to me you can e-mail me at wendiblocker6@aol.com.